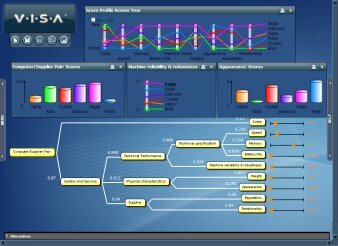 What is V·I·S·A Decision Making Software? Home > What is V·I·S·A? What is V.I.S.A Multiple Criteria Decision Making Software? V·I·S·A software is for decisions with multiple, tough to balance, factors; for decisions where no option matches all of the criteria perfectly; or for decisions where more than one person has a say in how the decision is made. It does not tell you the "right answer", it lets everyone involved see for themselves what the best overall decision is, weighing up all the factors using a considered and sound process. V·I·S·A also documents how that decision was made and why it was the right outcome for future reference. V·I·S·A has been helping people make tough decisions since 1986. You can consider all the issues and alternatives in an organized, methodical, documented way with V·I·S·A, or you can take a guess! V·I·S·A stands for Visual Interactive Sensitivity Analysis. It is visual and interactive so that you can explore the decision easily and quickly, while showing how sensitive the decision is to small changes in how people score or weight the alternatives and criteria. When multiple stake holders are involved, V·I·S·A promotes clear communication and it focuses stake holders on the topics that are worth discussing. For individual decision makers V·I·S·A helps you think through all the alternatives in a well structured manner and know that you have considered every aspect rationally. It helps you see which criteria impact the decision most so that time is spent evaluating these, not wasting time and energy on factors that will not help to distinguish between the alternatives, and come to a final decision. Read a short summary of how to use V·I·S·A Decision Making Software. he principles and techniques of V·I·S·A and MCDA are taught across the world, but why choose them?